Some research suggests infants display a tendency to judge others’ prosocial behavior, and in particular, that infants show a strong preference for prosocial others. For example, data from one frequently cited and well-publicized study showed that, after watching a puppet show with three puppets, 74% of infants chose the puppet that “helped” rather than the puppet that “hindered” a third puppet from attaining its goal. The purpose of the current investigation was to replicate these methods and extend them by including a within-subject measure of infant puppet choice across repeated trials to assess the stability of infants’ choice. In the current study, 20 infants viewed a puppet show and chose between two puppets (i.e., helper or hinderer) immediately following the puppet show. Although results were similar to previously published work on the first-choice trial (65% of infants chose the helper puppet on the first trial), infants did not consistently choose the helper across trials; several infants demonstrated a side preference, with 9 infants almost exclusively choosing puppets presented on the right or left side. The current investigation addressed limitations of previous research by including a between-subjects (replication) as well as a within-subjects (extension) repeated measure of choice that allowed for the examination of the stability of the choice measure. 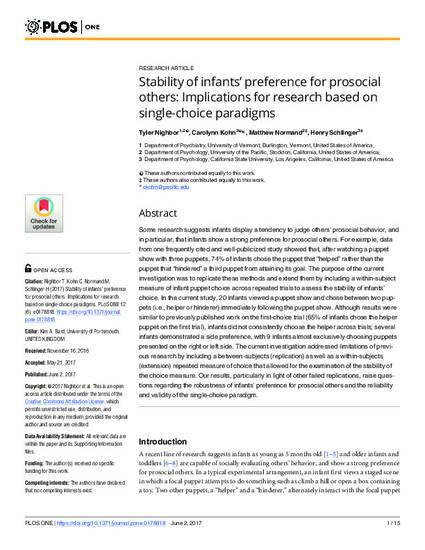 Our results, particularly in light of other failed replications, raise questions regarding the robustness of infants’ preference for prosocial others and the reliability and validity of the single-choice paradigm.